The sodium content in the knee cartilage can be used as a marker for the detection of osteoarthritis at an early stage. RAPID Biomedical offers a 23Na knee coil as an important device for this application. The coil is also equipped with a proton channel to reveal the morphology of the knee. For enhanced sensitivity both channels are equipped with quadrature polarization. 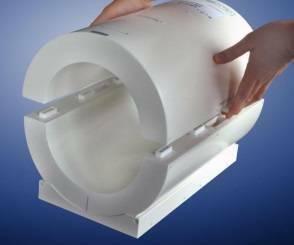 The split coil housing supports patient positioning and comfort. Medical Device, CE-Classification IIa (MDD, Annex IX).